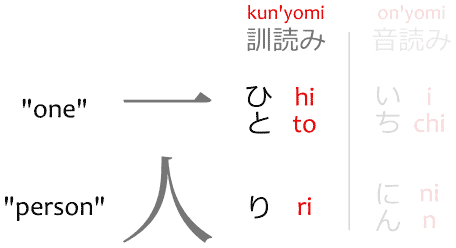 A kun'yomi 訓読み, also transliterated as kunyomi, and sometimes written in dictionaries as just kun 訓, refers to a reading of a kanji 漢字 based on a Japanese word that existed before the kanji were imported into Japan from China. Its counterpart is the on'yomi 音読み. Their differences were explained in kun'yomi vs. on'yomi.